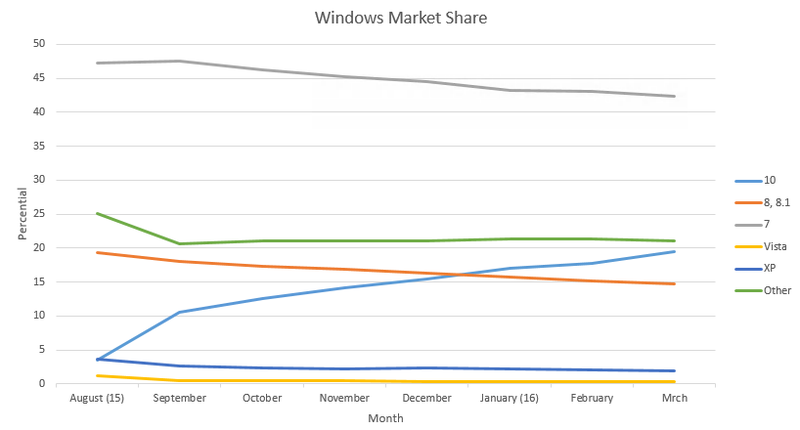 If you look at Windows releases over time (starting August 2015, the month after Windows 10 was released) you can see that 10’s adoption rate has been steadily climbing since launch. What also can be noted at the same time, is that 7 and 8/8.1’s shares have gone down since the launch, this is likely attributed to Microsoft’s exceptionally pervasive, and aggressive marketing tactics. In fact if you are using a PC with 7 or 8.1 installed, you probably have been asked more than a few times to upgrade to 10 with nagging popups or reminders from the upgrade application sneakily pushed on to systems within a previously installed update. Or by means of discretely adding the upgrade to the optional update list, and checking the box to install it all by default. Given this push from Microsoft for us to upgrade to the latest version, its interesting to see the software giant just release it for free to Windows 7 and 8 users. Given their ambitious goal of having 10 installed on a billion devices in just a few years, it seems almost justified to use such aggressive tactics. However, even with this effort-infused push it is much more interesting that roughly on the 1 year mark, all this pushing will just stop. 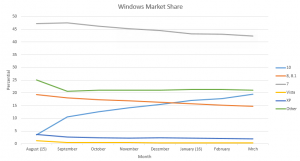 The updates will stop forcing themselves, and the popups will similarly vanish (According to Microsoft press releases, the operating system is running on about 350 million devices, leaving the majority of their journey still ahead. More recently Microsoft admitted it won’t reach its goal within the original intended time frame). In two days, on July 29th the (metaphorical) window to get the latest Microsoft operating system for free will close. Immediately following the 29th those of us who have defiantly decided to continue using 7 or 8.1 will no longer be bothered by the invasive reminders, or the sneaky updates. Peace once more. For those of us who are using the latest, a few days later on August 2nd, will mark the second major update to Windows 10, quaintly referred to as “The Anniversary Update.” Keep in mind though, this update is likely to silently install like the rest with little fanfare. In any case, the update looks like a continued push on Microsoft’s part to sway any remaining people to take the upgrade. In my opinion, its worth the try. Especially when you consider the ability to roll back to the previous OS you were using within 30 days. So try it, the worst case is rolling back to right where you started from.